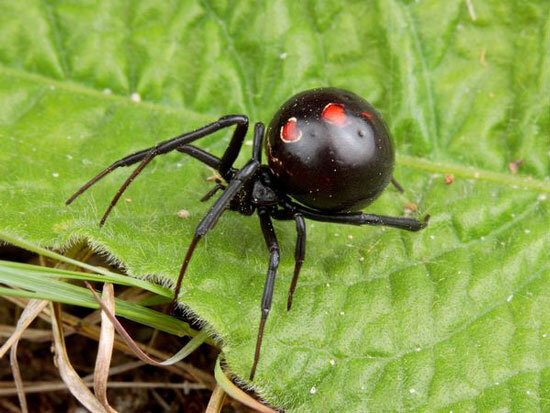 The black widow is the most venomous spider in the U.S., however, people rarely die from black widow spider bites, since the amount of venom injected is so small. 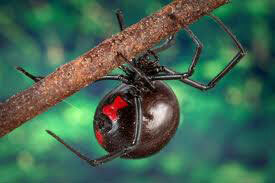 Black Widow spiders are usually discovered near the ground and around metal buildings and doors. They're also prevalent around brick homes. Probably because they prefer a heat source and both of these surfaces absorb & reflect the sun's warmth. They can expected to live around downspouts, electric meters, water hoses, barns, garages, wood piles, basements, crawlspaces, etc. They build irregular-shaped, 3-D webs that don't seem to have any rhyme or reason for their design, whereas other spiders seem to put more thought or design into it. The females lay eggs in 1/2" long oval egg sacs which hold from 25 to 900 or more eggs. If you want to do further research, check out our trusted resources to learn more about this particular pest. 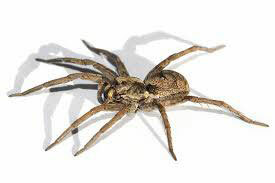 The Brown Recluse spider is only one of two spiders living in Texas, considered poisonous by State Health Services, the Black Widow spider being the other one. The species are generally brown in color and are identified by the dark brown fiddle-shaped pattern on the head. 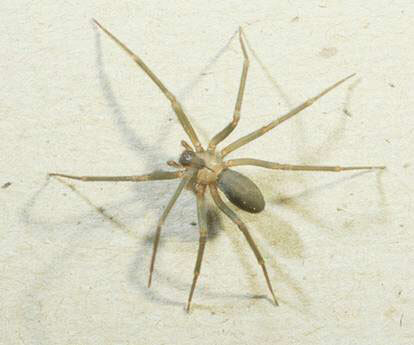 Brown recluse spiders have six eyes instead of eight. 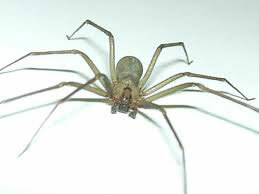 Because they hunt for their food, Brown recluse spiders are more active at night. 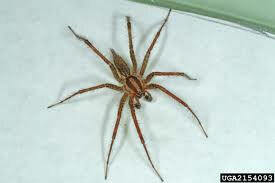 During the day, they can be found hiding in garages, shoes, under furniture and in deep corners or crevices. The Brown Widow spider also has the hourglass marking underneath, however, unlike the black widow, the hourglass is orange to yellow orange in color. According to Dr. G.B. Edwards, an arachnologist with the Florida State Collection of Arthropods in Gainesville, the brown widow venom is twice as potent as black widow venom. 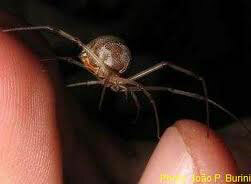 However, they do not inject as much venom as a black widow, are very timid, and do not defend their web. 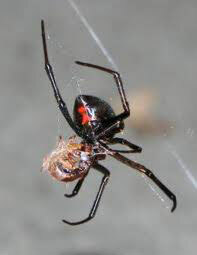 The brown widow is also slightly smaller than the black widow. 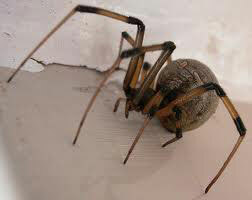 The Cellar spider is usually found around ceilings of basements, garages, attics. They tend to build a messy web which resembles a cob-web. This spider eats other spiders and when food is scarce, will abandon it's own web and go to the web of another spider. It will trip the threads, causing the other spider to come running out, only to be caught and consumed by the Cellar spider. 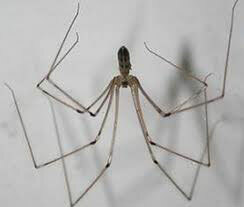 Sometimes called "daddy-long-legs" spider, that name is also mistakenly given to another similar spider called the Harvestmen. 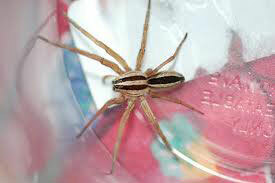 Grass spiders belong to a family of spiders known as "funnel web weavers". They create little web funnels in the grass or in crevices of buildings, fences or low-lying foliage so that unwitting insects can wander into the opening of the funnel and become entangled, triggering telegraph lines for the spider to respond to. 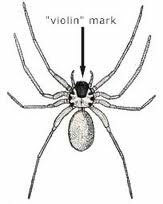 These spiders are extremely wide-spread throughout our East Texas region and are the principle spider people see entering their homes. 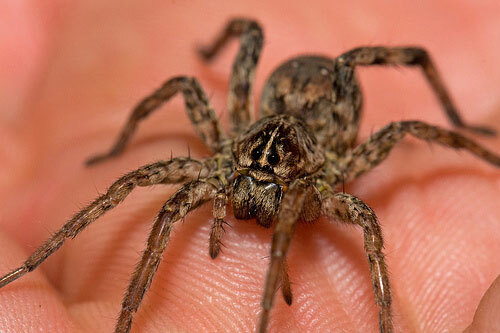 Wolf spiders are sometmes mistaken for tarantulas because of the very large size and hairy legs of these spiders. 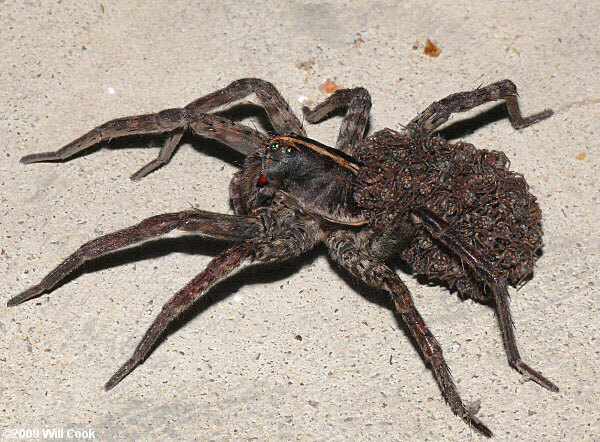 Wolf spiders carry their egg sacs underneath them until the eggs hatch. After which (pic 3), the young spiderlings cling to the mother's abdomen for a short time after hatching. These spiders can be seen in the yard under a light at night. Their large eyes reflect the light. 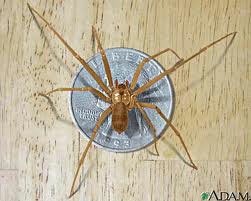 The Yellow Sac spider is often confused for the Brown Recluse spider because of similar size and coloration. 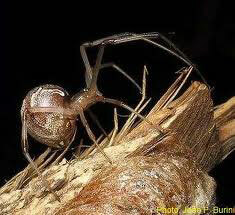 But like the Brown Recluse, these spiders are active in the night, where they wander around to find prey. The prey is a wide diet of arthropods, including spiders larger than themselves and even their own eggs. The spider does not produce webs. Instead they construct sacs in protected areas. 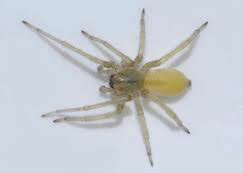 The idea of creating sacs instead of webs has given the Yellow Sac Spider its name. 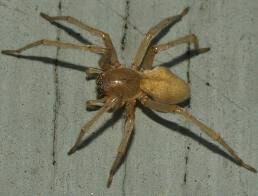 Yellow Sac spiders are the probable cause of more spider bites than any other kind of spider, and their bites are probably often misdiagnosed as brown recluse bites by health care providers. Their bite is quite painful from the outset. A person usually develops redness, swelling, and itching near the site of the bite. Redness disappears after about 72 hours and the skin heals in a week or two.